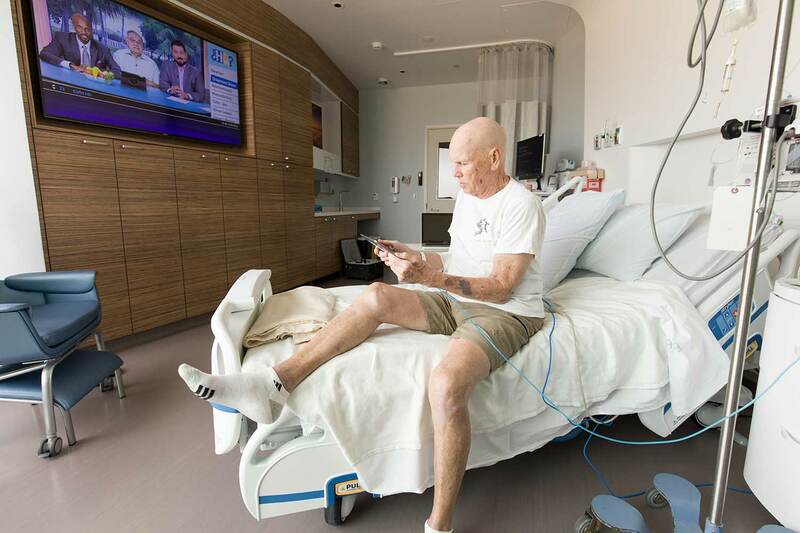 Every patient room at the newly opened Jacobs Medical Center at UC San Diego Health is equipped with Apple TV and an iPad, allowing patients like Joseph Cussen to control their televisions, lights and other room features. Admiring a San Diego sunset through floor-to-ceiling windows, Joseph Cussen basks in the red glow reflecting off of a cascade of glass office buildings visible from across University Town Center. When the warm lights finally disappear, he picks up an Apple iPad that sits at his bedside. With a swipe and tap of the device, he adjusts the lights and the temperature and lowers the shades before settling in for the night. Since the summer of 2016, Cussen has spent 70 days in hospitals while being treated for leukemia. In November, he became the first inpatient at the newly opened Jacobs Medical Center at UC San Diego Health. Besides the floor-to-ceiling windows in all patient rooms, the new medical center allows patients to employ a combination of technologies not found at other California hospitals, moving inpatient care to a new level. Jacobs Medical Center, a 245-bed medical and surgical specialty hospital, has an iPad and Apple TV in every private room. Upon arrival to room, patients have immediate access to a tablet that allows them to take command of their room environment, reducing the need to call or wait for assistance to lower blinds or adjust the room temperature. But it’s the secure access to their own medical records, using the new MyChart Bedside app, that enables patients to have more information in their hands than ever before. After patients create their own pin to access the tablet, and a second pin to access medical records, they have safe and easy access to test results, photographs and biographies of their healthcare team, a schedule of medications or upcoming procedures and educational materials prescribed by physicians. Cussen finds access to his medical records through the MyChart Bedside app the most beneficial tool, giving him perspective on changes to his health. As a patient in the blood and marrow transplantation program, Cussen wants to see lab results and other charts to see how his treatment is progressing. When considering the latest technology available for an improved patient experience, the information services team’s first priority was patient privacy, said Sylwestrzak. Ensuring that a patient’s medical record and personal usage data is erased when the individual leaves the hospital room is critical. 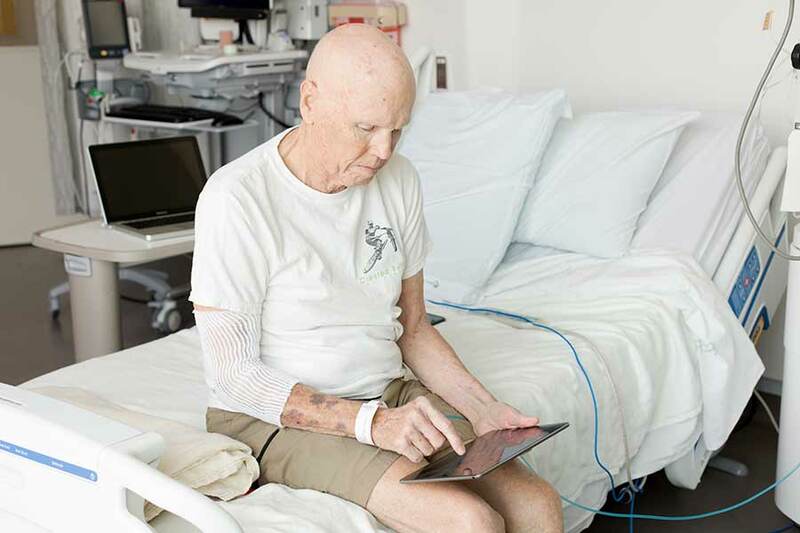 To do this, the tablets leverage Jamf Pro (formerly Casper Suite) to automatically wipe patient data from each iPad immediately following a patient’s discharge and prepare the iPad for the next patient, leaving no trace of a previous user’s history. Jamf Pro communicates with Epic, the electronic health record system in place at UC San Diego Health, to coordinate iPad management with patient records, ensuring that patient privacy is protected at all times. To manage the room environment, a Creston application is installed on each tablet for patients to adjust room temperature, lights and shades. iPads also are equipped with popular entertainment apps, but patients have the option to download their favorite apps as well. In addition, using the mirroring feature, patients can share what’s on the tablet with others in the room by pushing the content onto Apple TV. Cussen certainly does, calling his experience at Jacobs Medical Center amazing. Still, he’s looking forward to the day he can get back on his bike.